Writer Erin Silver interviewed me during her preparation of ﻿﻿﻿this article﻿﻿﻿, and I am quoted within the piece. by Elizabeth Tomaras, Montreal Families - Published in the December, 2014 edition. Natalie Segall was 16 when her father committed suicide. She said it was difficult to function; she felt guilty, isolated and confused. She didn’t have an outlet to express her grief nor did she understand how to do so. As an adult, she decided to help others going through similar situations. A certified grief and loss consultant, educator and facilitator, she organizes memorials, support groups, and workshops to help those dealing with a variety of loss by normalizing what they feel and empowering them to move forward. “I really take pride in offering different avenues of expression,” Segall said. For the past 10 years, Segall has helped facilitate grief programs with the Mount Royal Commemorative Services led by grief expert Dawn Cruchet. Now that Cruchet has retired, Segall will be leading a workshop on Dec. 6 called Good Grief Workshop for Children and Teens. It will aim to help children as young as 3 understand how to deal with grief and loss in a constructive way. “It’s about helping kids and teens incorporate their grief into their lives in a healthy way for the future,” Segall said. Kids will be divided into groups, by age, to allow participants to be among peers. They will decorate ornaments for their loved ones, release balloons with messages written on them and do other activities. by Helga Loverseed, The Montreal Gazette - Published: Saturday, August 23, 2014. > There is an article featuring the Good Grief Workshops (also with some background on me!) on pages 12 & 13 of the August 12, 2014 edition of the Westmount Independent. After hearing friends say they couldn’t cope with the loss of their loved ones and nobody understands, Segall decided to become a loss and grief educator, consultant and facilitator. She studied with Cruchet, took courses, and pursued a degree in education. Segall spent four years as a cancer patient education coordinator at the Royal Victoria and Montreal General hospitals. But while she kept a private practice, “it was very sparse,” Segall said. Since leaving that job, she’s restarted her private practice and offers individual grief support in person or via Skype, and group workshops. When Segall’s counsellor and mentor Dawn Cruchet retired, she asked Segall to coordinate the Good Grief Workshops for Children and Adolescents, sponsored by Mount Royal Commemorative Services. “I’m honoured,” Segall said. An “awesome volunteer team” made up of nurses, social workers, doctors, school staff, retired people and others from all walks of life devote a Saturday twice a year for the workshops, which happen in facilities provided by Selwyn House, she said. Children ages 2 to 18 validate and share feelings in age-specific groups, while their parents or guardians attend a separate group. The workshops give children tools to help them express and “own” their grief, including art therapy, talking, storybooks, exercise, memory boxes, Segall said. As Leonard Cohen sings, “There is a crack in everything…that’s how the light gets in.” When Natalie Segall’s mother was diagnosed with tracheal cancer, Segall dedicated her life to caring for her. After her mother died, Segall found it extremely difficult to get back to her previous life, as the entire landscape had changed, and so had many of the people in it. It was not until she met leading grief specialist and educator, Dawn Cruchet, that she learned how to process what had happened, and bring meaning to it. Through this support, Segall was eventually able to deal with her grief, and resume a healthy life. This defining process ignited a deep empathy and passion within her that lead her to the career she finds herself in today. Through her desire to help others, she decided to become a grief specialist, facilitator, and educator herself. Segall then went back to school and earned two degrees and several certifications in order to gain professional qualifications to match her personal experiences. Since then, Segall has devoted herself to making a difference in the world. For many years, she has not only worked with patients and family members, but she has also trained doctors, nurses, and other health care professionals who must care for people with chronic and terminal illness. She has worked in the oncology departments at both the Royal Victoria and Montreal General Hospitals. Today, Segall celebrates a proud moment. She has just accepted a new position: she will become the new coordinator of the “Good Grief” workshops, in partnership with Mount Royal Commemorative Services. In fact, she will replace none other than Dawn Cruchet, who announced her retirement this past January, and is pleased to pass the torch. 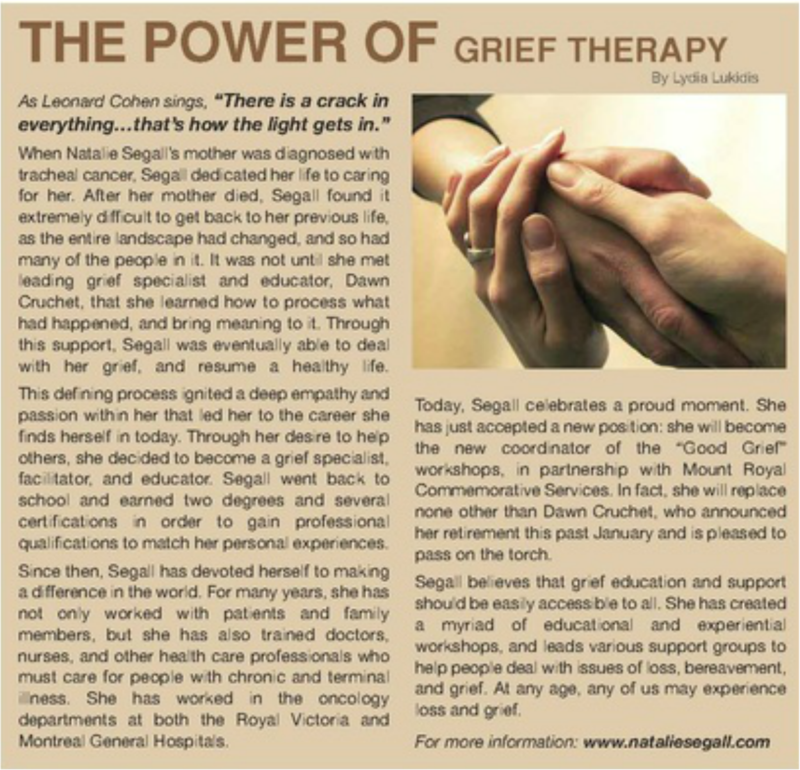 Segall believes that grief education and support should be easily accessible to all. She has created a myriad of educational and experiential workshops, and leads various support groups to help people deal with issues of loss, bereavement, and grief. At any age, any of us may experience loss and grief.